Still shilly-shallying over shale? Dutch Institute TNO has teamed up with the Argumentation Factory to address one of Europe's hottest environmental issues. Visualising arguments helps people assemble their throughts and get to grip with complex problems according to The Argumentation Factory, based in Amsterdam. Their Argument Maps, constructed for government agencies, NGOs and commercial organizations, are designed to enable people to make better decisions and share and communicate information. 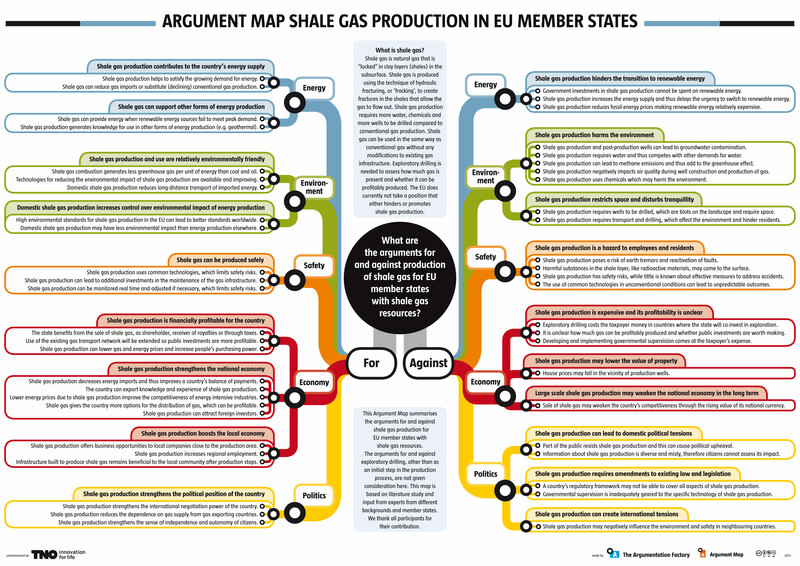 Dutch research organisation TNO, in association with The Argumentation Factory, have launched the European Shale Gas Argument Map detailing the pros and cons of the production of shale gas for EU member states with shale gas resources. Their map is designed to provide the foundation for an open discussion and help the user make a balaced assessment. 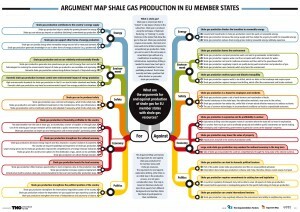 “Currently there is a public debate on shale gas in different EU Member States and an independent overview of the arguments is essential to enable the parties to come to a consensus,” says Lambert van Nistelrooij, member of the European Parliament. René Peters, Director of Gas technology at TNO, emphasises that at first the risks have to be studied as well as alternative methods of production of shale gas in order to keep costs and risks down. “There is a debate on the pros and cons of shale gas. That is all right. But TNO thinks that the decision on whether or not to proceed to acquiring shale gas should be a well-informed one.” TNO commissioned the Argumentation Factory to accompany the research process that took place with various international stakeholders from public and private sectors including government, NGOs and research institutions in order to identify the advantages/disadvantages indicators.